Preston Truman Boyd gives a beyond LOL starring performance as Robert Grove in Mischief Theater Company's Olivier and Tony-winning comedy The Play That Goes Wrong. A familiar face on B'way, Preston co-starred as Artie Green in the recent Sunset Boulevard revival and appeared in She Loves Me, On the 20th Century, Bullets Over Broadway, and Big Fish, as well as tours of Jersey Boys & Young Frankenstein. Scroll on as Bbox gets to know Preston a bit better as he talks about surviving an eight-show week at The Play That Goes Wrong, nightly Broadway master class with Glenn Close, and the craft beer to embrace in November. 1. What was your approach to Robert Grove? Who is he to you? 2. This play is nonstop and packed with physical comedy. What is your pre-show like? Staying limber, well-rested, and hydrated is the only way to ensure a full eight-show week! 3. This is your first time replacing on Broadway. What was the most surprising thing about jumping into a play that’s been running? When I saw The Play That Goes Wrong on Broadway, it was truly the funniest thing I had ever seen on stage. Walking out on stage every night and hearing a literal roar of laughter never gets old. The fact that the audience is so present with us and hanging on every moment throughout the entire show is really a special experience. 4. What’s your most cherished memory of Sunset Boulevard? Sunset Boulevard was one for the BOOKS, I had so many incredible memories! Being able to stand on stage and observe the MASTER CLASS that it was watching Glenn sing “As If We Never Said Goodbye” was transcendent. 5. You’ve been a swing in four Broadway musicals. What do most people not know or understand about the job of a swing in a Broadway show? Not only do you have to cover (learn the roles of) a handful of ensemble members and principal characters, you need to be ready to hit the stage at a moment’s notice...sometimes in the middle of a show, a la my debut in Big Fish! I would often refer to swinging as being a DH for the baseball fans out there. 6. Tell us a memorable audition story. I must say, being on stage for final callbacks at the Lyceum Theatre for The Play That Goes Wrong was really something I will never forget. 98% of the time auditions and callbacks take place in a studio in a random building in midtown, and the fact that we were up on the stage and on the Tony Award-winning set for finals was electric. 7. What sitcom can you repeatedly watch and laugh every single time? 8. As a self-proclaimed craft beer enthusiast, which craft beer should we embrace this November? Well well weeeeellll, I’m so glad you asked :-). I generally switch from my beloved hazy IPAs to darker stuff in the fall/early winter—i.e. porters, stouts, and brown ales. I’m a big fan of the George from Hill Farmstead out of VT.
9. If any PTGW cast member was going to make you break onstage, who would it be? 10. What was the show or experience that got you hooked on theatre? I saw a traveling production of The Guthrie’s A Midsummer Night’s Dream in 5th grade. The production was so rule breaking. It was the first time I saw there are no boundaries in theatre and that excited me. 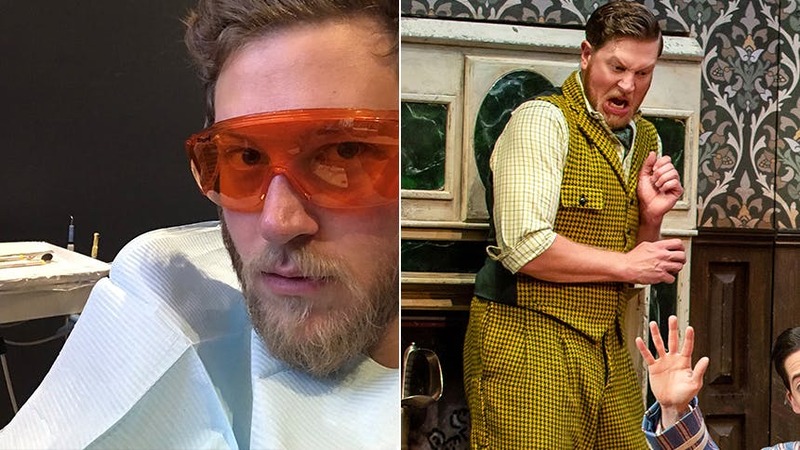 Don't miss Preston Truman Boyd in 'The Play That Goes Wrong' at Broadway's Lyceum Theatre through January 6.